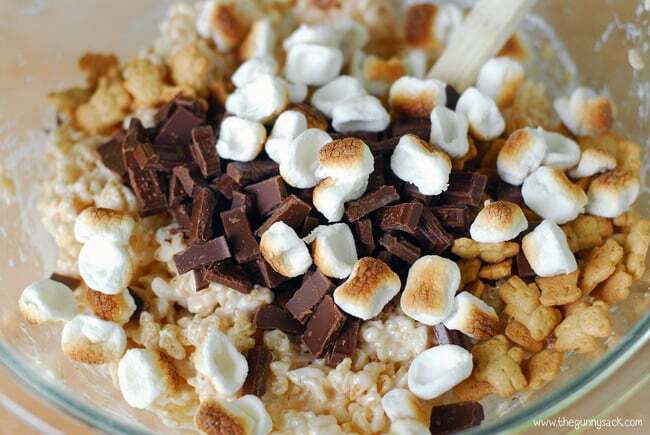 S’mores Rice Krispies are an easy summer dessert recipe. 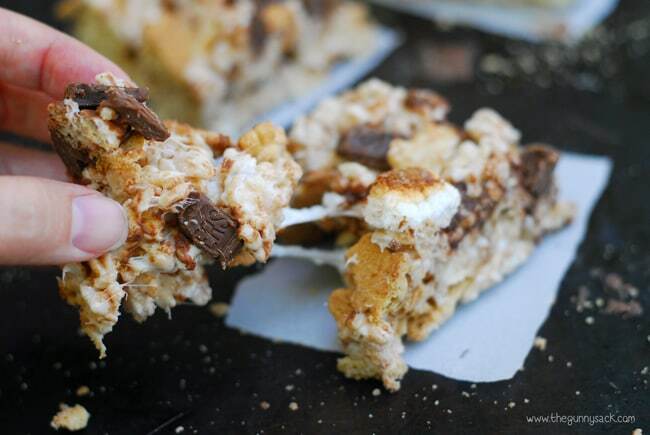 Mix toasted mini marshmallows, chopped Hershey’s bars and Teddy Grahams into Rice Krispie Treats! 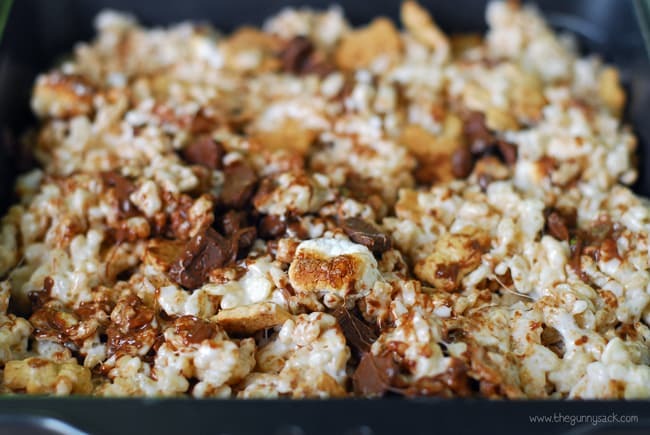 As s’mores week comes to an end, I wanted to share a rice krispie treats recipe. 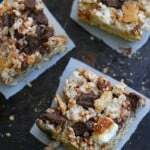 Isn’t it crazy how many different kinds of Rice Krispie bars you can make? 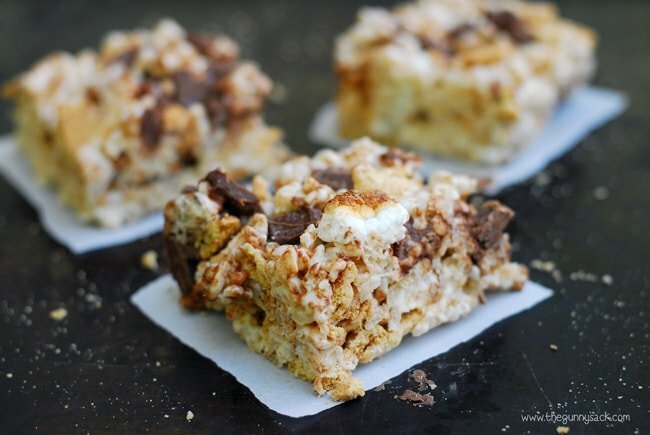 For these s’mores rice krispies treats, before you even add extra ingredients, you can make the bars more hard and crunchy or soft and gooey. Then, you can pretty much add any of your favorites ingredients or flavors. I wanted to get the flavor of campfire s’mores, so I used toasted marshmallows instead of plain ones. Rather than use graham crackers, which would probably get soggy, I used mini Tedd Grahams. And of course, a s’more isn’t complete without Hershey’s bars! 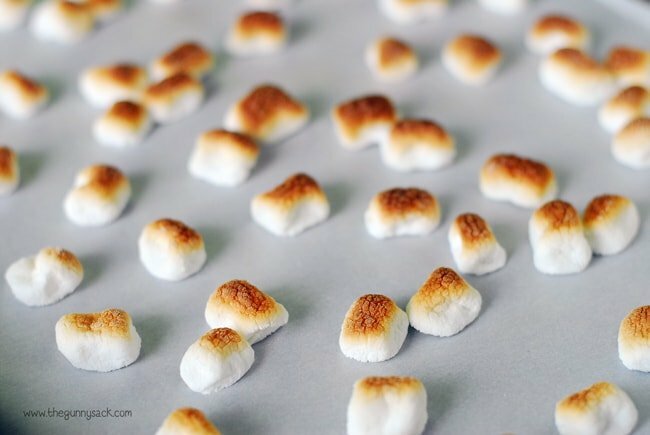 Start by toasting mini marshmallows under the broiler on a baking sheet lined with parchment paper. Set aside to cool. Then, cut up or chop 2 Hershey’s milk chocolate bars, set aside. Add 3 cups mini marshmallows and stir to coat them with the melted butter. Return to the microwave for 45 seconds, stir until smooth. Return to the microwave for 10-15 seconds longer, if necessary. 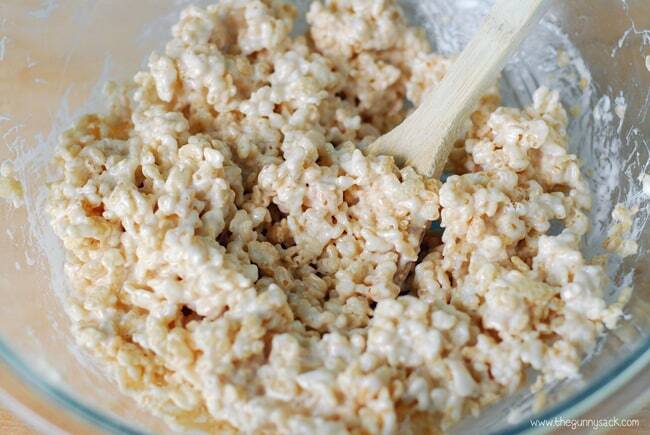 Mix in Rice Krispies. 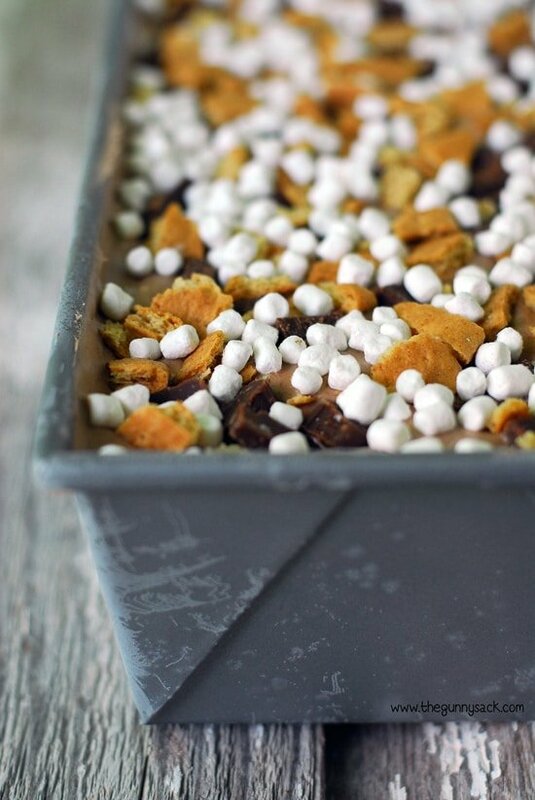 Mix the mini toasted marshmallows, chopped Hershey’s bars and mini Teddy Grahams. Press into a greased 9 inch square pan. 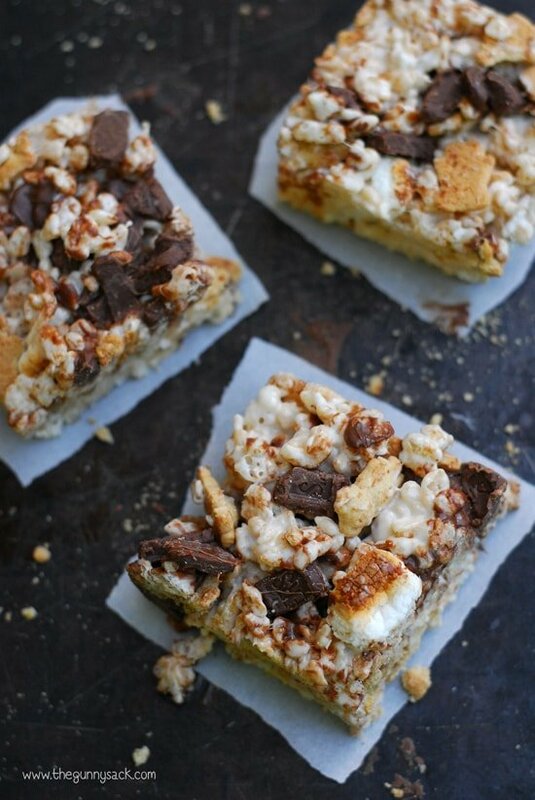 Enjoy the soft, gooey combination of two of your favorite treats: S’mores Rice Krispie Treats! Start by toasting 1 cup of mini marshmallows, under the broiler, on a pan lined with parchment paper. Set aside to cool. 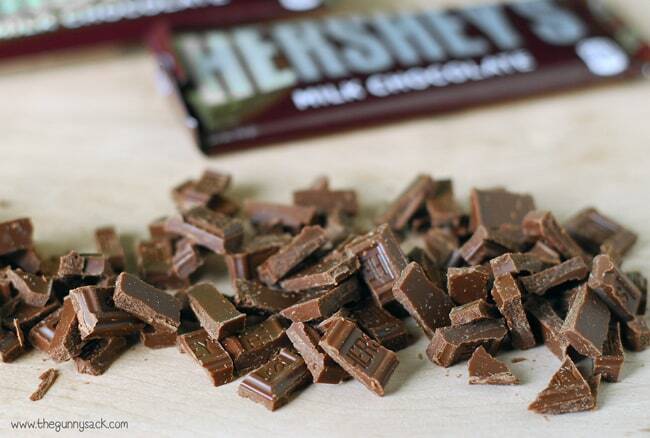 Cut up or chop 2 Hershey’s milk chocolate bars, set aside. Return to the microwave for 45 seconds, stir until smooth. Return to the microwave for 10-15 seconds longer, if necessary. 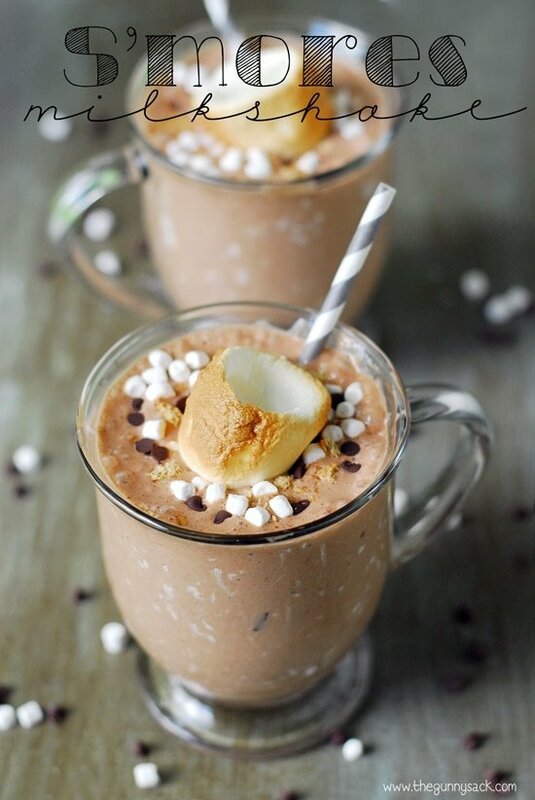 Mix in the mini toasted marshmallows, chopped Hershey's bars and mini Teddy Grahams. just made these. 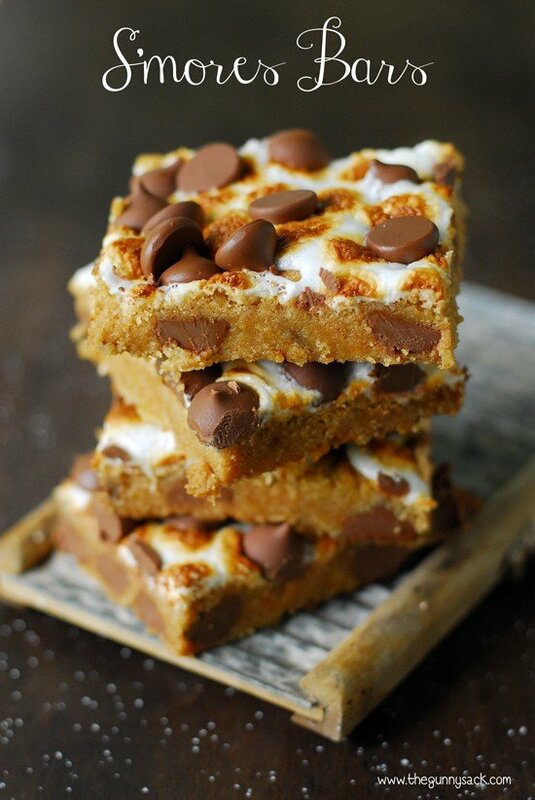 I used crunched up graham crackers and chocolate chips and I didn’t toast the marshmallows. Also, I melted the butter and marshmallows on the stovetop. They didn’t exactly mix up great, but I didn’t mix it all in before I put in the melted marshmallow. They turned out wonderfully though!! They’re chilling now and I’ll cut them tomorrow. These are amazing! I’ve been wanting to try something like this. . it’s like my two favorite sweet treats in one! love! I love the gooey pull away on that last photo!